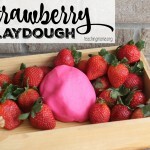 I love making homemade play dough. It’s so easy and lasts for a long time! 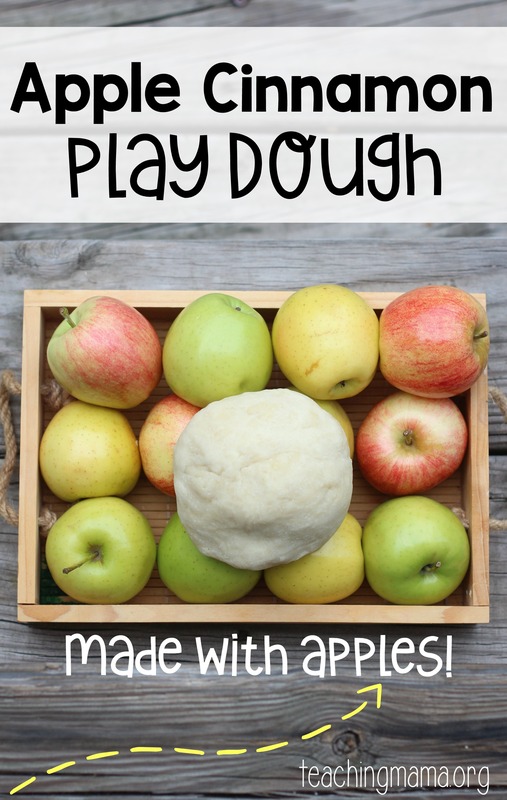 I know there are lots of play dough recipes that are apple themed, but none of them use real apples. This recipe does! 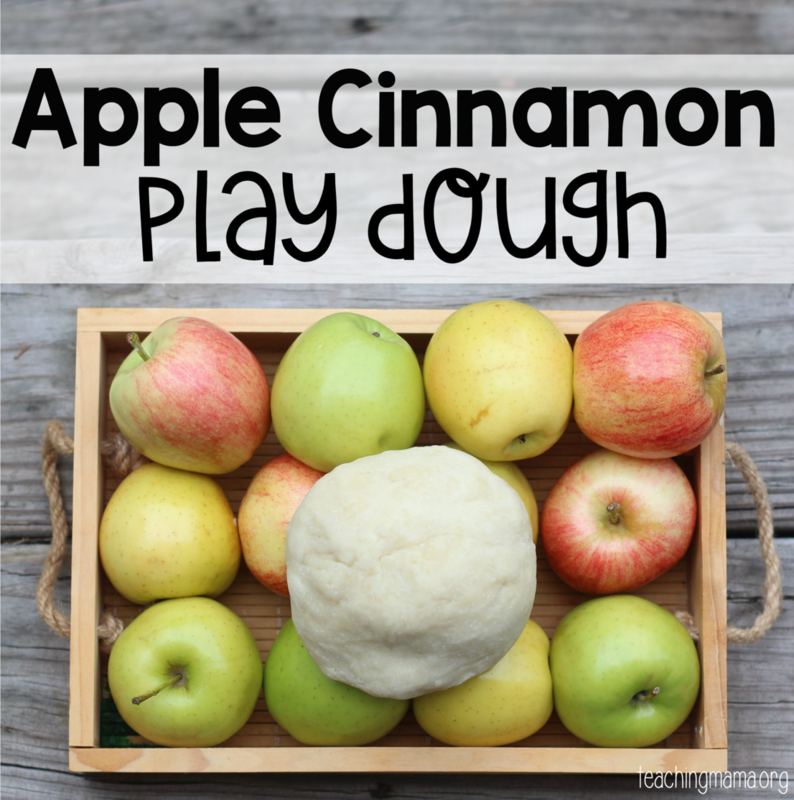 After hours in the kitchen, I perfected a new recipe of apple cinnamon play dough! It smells so great! This recipe uses ingredients you probably already have in your cupboards! I chose to make this a natural color and did not use food coloring in this recipe. You can use food coloring if you’d like to make it more vibrant looking. Core, peel, and dice the 3 apples. Pour produce protector (or lemon juice) onto the apples to keep them from browning. Then place them into a food processor. Purée the apples in the food processor. Turn it on for 30 seconds, then turn it off to scrape the sides. Repeat until the apples are puréed. Pour the puréed apples, 1 cup flour, 1/2 cup salt, 1 tablespoon cream of tartar, and 1 tablespoon vegetable oil into a pot. Mix together, then heat the dough on medium-high heat for 5-10 minutes. Continue to stir the play dough while it’s heating up. After a few minutes, sprinkle a handful of flour onto the dough and continue stirring. 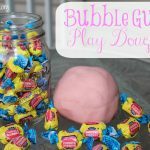 It will be a bit mushy at first and you may doubt that it can turn into play dough. However, after 5-10 minutes you’ll start to see it form together into a ball. 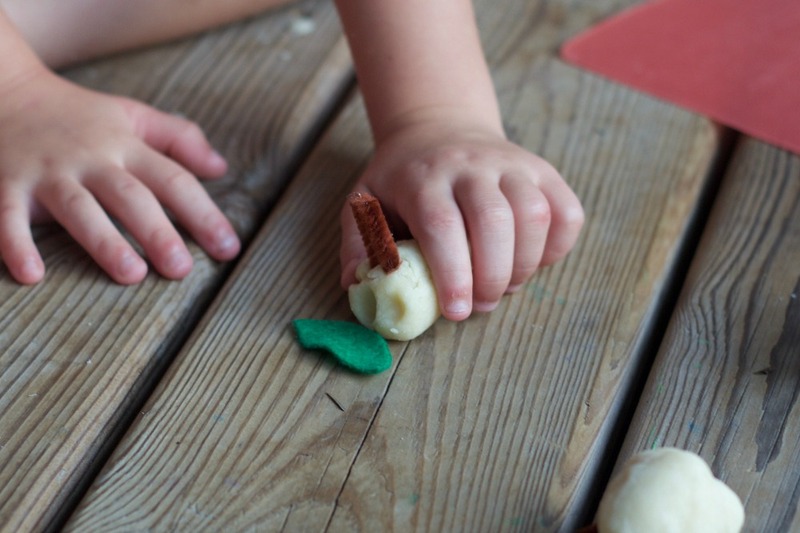 Once the play dough no longer sticks to your finger when you touch it, it is ready to be transferred to a cutting board with flour. 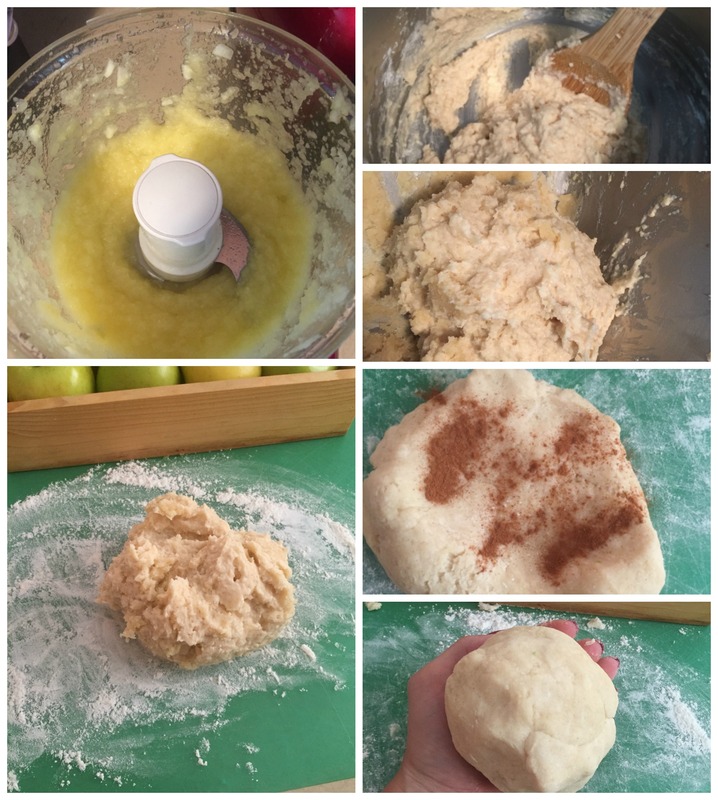 Knead the dough with some flour and add in cinnamon. 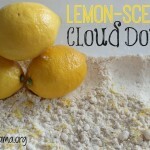 (I suggest 1-2 teaspoons, but you can add in more if you like a stronger scent.) 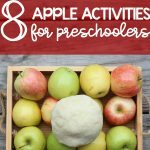 Apples don’t have a strong scent, but cinnamon makes it smell stronger! 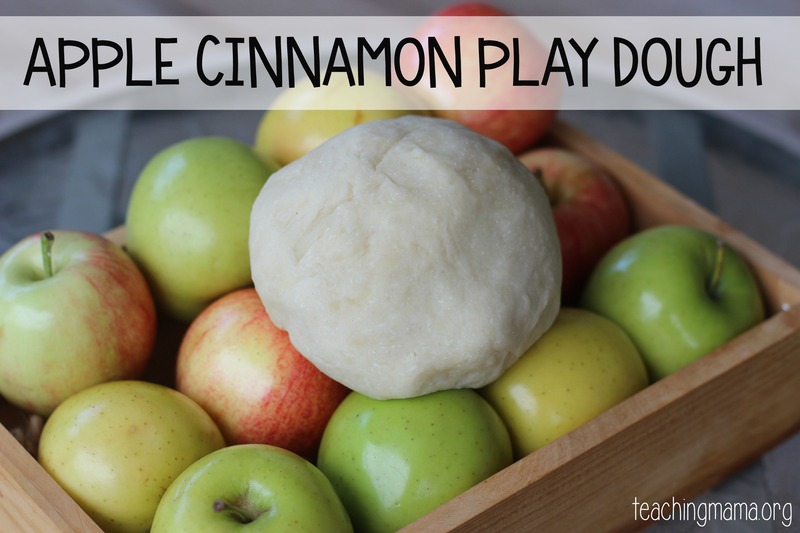 Play with the apple cinnamon play dough! 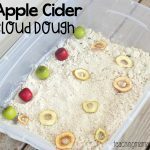 After playing, store the dough in an airtight container. Leave it in the refrigerator to make it last longer. I love how the play dough turned out! The kids did, too! 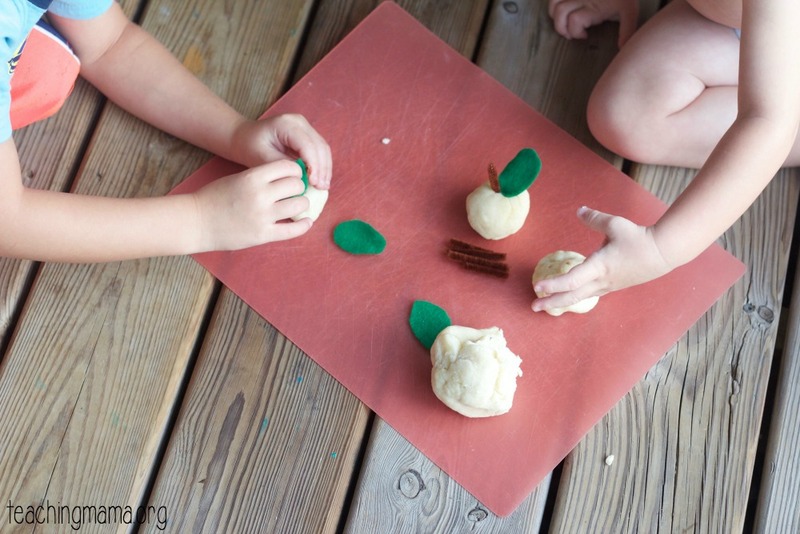 They enjoyed making their own “apples” with the dough. I gave them pipe cleaners and felt-shaped leaves to play with. Wesley thought he should make a caterpillar eating a leaf. So cute! I love it when my kids play with play dough. They not only can use their creativity, but they are building up hand strength and building up their fine motor skills. Plus they think it’s fun! Hope you’ll try this recipe out. It’s a fun one! 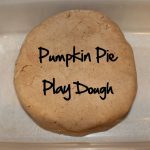 If you’d like to see me making the dough, check out my video! Do you know about how much apple sauce you wind up with when you’re done? I have unsweetened apple sauce in my cupboard I’d like to use, not sure how much I need to make 3 apples worth though. thanks.